It is advisable to take the help of a personal injury attorney in case you’ve injured yourself in an auto accident. Dealing with the attorneys or car insurance companies of the other party and negotiating for an agreeable and fair settlement can be difficult for an individual who doesn’t have enough legal knowledge or experience. Negotiating with car insurance companies and arriving at a fair settlement is common for personal injury lawyers. They deal with them daily and have a good knowledge of the settlement entitled to you. In case of an uninsured driver, there are settlement avenues that you might be unaware of. An attorney with good experienced and well-versed knowledge of law can help you with such avenues. These attorneys, with frequent dealings with similar cases, can give references for the medical care and concern you need. 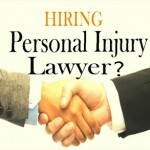 Also they understand the effects of the injuries, which can actually help in calculating a fair compensation. If you’ve not reached a settlement with the insurance company or need to sue it, then the personal injury attorney can present your case in court and get you full coverage. Selecting an attorney who will get you the best possible settlement is necessary; hence choose an experienced attorney with a good record. You can get attorney information from friends; family; state bar association; advertisements or referral services. Explore your choices and discuss all fees and costs before making a commitment. Choose an attorney with whom you feel comfortable sharing each and every detail of your case. You should give all relevant case information the attorney. This information include details of your vehicle and accident; details of the other driver, vehicle, any witnesses; medical reports; physical evidence; lost wages details or records of medical and other expenses. Here, you need to know that lawyer’s costs differ with case complexity and time. They mostly work on contingency basis and their pay is based on your settlement size.